Our Boy Angel ornaments are the perfect gift to commemorate and celebrate life’s moments! Your new baby boy. Is there nothing more angelic, especially while he’s sleeping? You may not see his tiny wings and halo, but you know they’re there! Whether this new addition to your life is your son, grandson, nephew, godson, tiny new neighbor or friend, a hand personalized ornament will become a cherished addition to his Christmas tree forever. 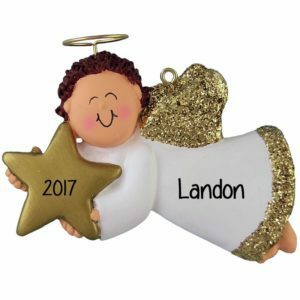 Let one of our talented personalizers add your personal sentiment to one of our adorable angel boy ornaments. Will it say “Grandma’s Sweet Angel’? 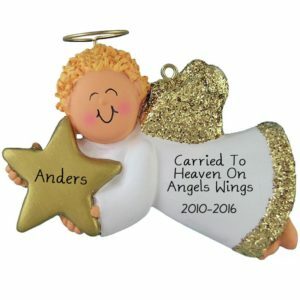 “Nana’s Gift From Heaven”? “My Precious Godson?” Our male angels are also perfectly suitable as memorials to male children and adults who are now in Heaven. Whatever you choose, know that Personalized Ornaments For You will create a gift worthy of an angel!